Our music messons in NYC are available by semester (19 lessons) or monthly packages. School year semesters run September through the end of January and February through the end of June. Semester payments can be prorated depending on when the student starts the lessons. 1. With monthly payments, tuition shall be paid on the 1st day of each month, for the upcoming month. For semester payments, tuition is due in full upon enrollment, non refundable. If a payment is more than 10 days late, a $25 late fee applies. Riverside Music Studios (Riverside Piano Inc) has the right to charge the card on file for amounts discussed. 2. With monthly payments, students are required to commit to at least one lesson per week (4-5 lessons per month). With semester payments, there are 19 lessons to fulfill within the semester dates. 3. There is no transfer of any portion of tuition from one month to another or semester to semester. Student request to reschedule and make up any lesson must be made at least 24 hours in advance, or the lesson will be forfeited. 4. With the monthly payment plan, there is a limit of 2 lessons per semester that students can miss without scheduling makeups. This policy applies only to lessons canceled at least 24 hours in advance. 5. All students are charged a yearly $60.00 registration fee upon enrollment as well as each following Fall. 6. Students are required to provide a 30 day advanced notice for ending steady weekly lessons. 8. Student’s participation in concerts, recitals, competitions and other events is strongly encouraged but not required. There is $85 off-premises performance fee for each student. 9. Riverside Music Studios reserves the right to provide substitute teachers when regular instructors are not available. We try to keep those situations to a minimum. 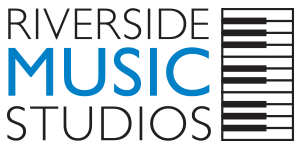 If a student cancels a lesson and needs to reschedule, Riverside Music Studios cannot guarantee that the rescheduled lesson will be with their normal instructor.